The white part of the eye is called the sclera. Overlying the sclera is a clear membrane called conjunctiva. A pinguecula is a yellowish patch or bump on the conjunctiva near the cornea, the clear front part of the eye. This patch most commonly forms on the side of the eye closest to the nose, but it can be on either side or both. Like a callus on the skin, a pinguecula is a deposit of protein, fat, and calcium. A pinguecula is typically harmless, but if it is thick, it can cause chronic irritation. As your eyelid blinks and spreads tears over the surface of the eye, the tears tend to run off the pinguecula first causing it to dry out and become bothersome. Usually, no treatment is necessary. If the pinguecula causes occasional or chronic irritation and redness, using artificial tears may be helpful. In certain circumstances, surgical excision may be required to restore comfort to the eye. A pterygium is a triangular-shaped growth of fleshy tissue on the white of the eye that eventually extends over the cornea. This growth may remain small or grow large enough to interfere with vision. 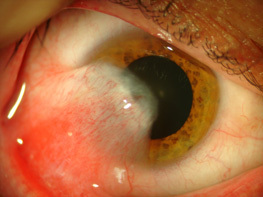 A pterygium can often develop form a pinguecula. Your eye doctor will evaluate the surface of your eye with a slit-lamp, the microscope used by eye doctors in the office to examine your eye. 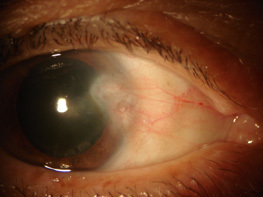 The pterygium is measured and photographed to allow for comparison at a later date. If your pterygium is causing irritation, but not affecting your vision, your eye doctor will likely treat your eyes for dryness. If your vision is affected or about to become affected because of the pterygium, or if significant growth of the pterygium is documented from one visit to the next, surgical intervention may be required. Surgical treatment for pterygium is done in an outpatient setting with only local anesthesia. The procedure itself is painless; however, mild to moderate post-operative discomfort is typical. Most patients are able to return to their job within the first couple of days after surgery. If your job requires time in a dirty environment, you may want to take a week off of work to allow time for good wound healing. Because the recurrence rate for pterygia after surgical excision can be as high as 50 percent, several different techniques have been developed to try and reduce this. The technique used by Panhandle Eye Group surgeons involves first surgically removing all abnormal tissue from the surface of the eye while leaving behind as much normal tissue as possible. At this point, several options are available depending on the severity of the pterygia, the age and race of the patient, and the fact of whether this is the first time or a repeat operation to remove the growth. Typically, a chemical called Mitomycin C is placed on the eye for 1-2 minutes and then thoroughly rinsed away. This chemical greatly reduces the chance for re-growth of the pterygia. Next, amniotic membrane is glued to the wound. This tissue comes from the lining of the womb and has incredible anti-inflammatory properties. Because inflammation is the main reason for pterygia to recur, this membrane greatly reduces the rate of recurrence. Even with great surgery and all of these interventions used to prevent recurrence, the pterygium still grows back in 5-10 percent of patients. Your surgeon will have you use antibiotic eye drops for about 1 week after surgery and a steroid eye drop for 4-6 weeks after surgery. A steroid injection into the surrounding tissue is sometimes performed during your surgery to further decrease any inflammation. Once your eye is healed, there are things you can do to prevent recurrence of the pinguecula or pterygium.